I did a lot of driving yesterday and whenever I pass this shop I have to slow down to take a good look at their window. It's Follitt in Petworth, a shop for one off pieces all beautifully arranged. Since signing the shop contract I have lost nearly a stone in weight. This is not through any deliberate effort on my part, it is just through rushing around with never a moment to rest and reflect. I also find that at lunchtime if I take a bite of sandwich a customer is bound to come in at that moment to ask a question. So eating anything has to be done surreptiously. My daughter is a huge influence for good. Instead of chocolate biscuits she makes me eat a seed bar (not something I'd choose to buy!) She herself prefers sushi and miso soup instead of sandwiches. Neither of which I fancy trying. But I realise I'm a bit stuck in my ways. I prefer to go with what I know rather than experimenting with something I may not like. Probably typically English! Late last night I put together some workshop proposals which I'll send out to everyone who has left me their contact details. And of course I'll publish it all here. The shop is selling noticeboards handmade by Catherine Hewson in Haslemere. Catherine often uses Emily Bond fabric, as shown. I think this one would be ideal for a dog owner to keep any doggie vet records, photos and of course, collar and lead. Good news! The long awaited card machine was delivered yesterday, just in time for today, Saturday's customers. I just made this cushion (front above, back below) but it's the blanket that's getting all the attention. I bought it at Harting Village Day this year and I wish I had made a note of the person who made it. Knitted in 4ply sock wool the colours and patterns remind people of Kaffe Fassett. I am getting the most interesting people coming in to the shop. One day it's American men searching for props for films; another day I had a fascinating discussion with a 'court dressmaker' who also used to make for Harrods. Yesterday I met a lovely lady who used to knit for The Scotch House in London and a London School of Fashion graduate who makes wonderful dramatic clothes. I'd like to host a clothes workshop. Upcycling something you own or something you've found in a charity shop with ribbon/ buttons/ bits of knitting and a bit of slashing to customise it into something uniquely 'yours'. That would be fun. Yesterday the latest issue of the Petersfield Post featured three of us new shops on page 4. Meantime the lovely photos I wanted to post I can't show you because picasa's not talking to blogger. It's a known error and I hope they fix it fast. With any luck I'll be able to post what I intended to post later today! Heart decorations by Kate Hackett. I did this sample of 'free knitting' ages ago but it still inspires me to pick up the knitting needles. Yesterday in the shop was the best of days and the worst of days. It was best because my friend Jane travelled over from Kent and we happily talked for several hours punctuated by cups of tea and many naughty chocolate biscuits. We were joined for a while by Mary from Liss who contributed lots of useful ideas and I hope Mary, who is an expert dyer will be a regular visitor . It was the worst day financially for the shop but then Saturday was the best day financially so it all averages out. What is the most convenient time for people to come to a workshop? I had thought evenings to suit mums who could come out once children were in bed, leaving dads to babysit but yesterday Mary and I remembered the 'Creative Lunches' East Hampshire used to provide for artists when there was more money in the pot and 'Creative Lunches' seem like a good idea for the shop as lunchtimes are usually quiet. But what food is clean enough to eat when you're also knitting/drawing/rag rugging/sewing or collaging? Just noticed that I said I'd show Kate's decorations today. Sorry. I'll take photographs of them in the shop today for tomorrow's blog post. These bags are made by Alison Crosthwaite. What's even more impressive is that some, if not all the yarns used have been spun and dyed by her as well. She's also dyed the lining. See them up close in Handmade Happiness! The shop also stocks Alison's silk painted cards.See the colour queen link on the right for more of her work. NEW in the shop today are Kate Hackett's handmade ceramic decorations. These are rather special. I'll show you what they look like tomorrow! The new Carluccio's in Chichester is a visual treat. The displays of gold and red wrapped food in the delicatessen area are stunning! Opulent luxury. We shared an antipasto verdure on a large black slate. Yum! Pictured behind - this big bowl of gold wrapped marrons glaces would look fabulous in the centre of a Christmas table don't you think? My daughter is learning to knit. This is the first thing she has ever knitted.And the first handmade item to be made in Handmade Happiness. She made them over two days in the shop for a friend's newborn baby boy. They aren't perfect but they are cute. The wool is mine but I have now ordered some baby soft alpaca yarn for the shop. Each day brings fresh surprises some good, some not so good. It was good to meet Catherine who makes noticeboards in Haslemere and Carole who stitches quilts in Emsworth. It was good to get the phone connected yesterday. Not so pleasing that the credit card machine failed to materialise and I had wanted it for the shop's busiest day, today Saturday. Ho hum but I am looking forward to meeting friend Kate tonight at the new Carluccio's in Chichester. Regular readers will know that Carluccio's is my most favourite occasional treat destination! Yesterday I realised that the shop is a bit knit heavy. Handmade Happiness shouldn't just be about textiles and paper. And it will in the future encompass pottery, glass, silver, maybe wood... It's a work in progress and a listening ear to the customers who are giving me lots of food for thought and bringing in their lovely work for me to see. I always say to people that everything is made locally, which it is, but my daughter thinks I should say it's all Made in Britain and have a little union jack on each price label. Now why am I not comfortable with that? I always like best the thing I've most recently made. And I love these necklaces of soft velvet. Yesterday was a day of conversations in the shop. A lovely lady who makes quilts and hangings. Hannah, with her painted boots who knits fun hats and I hope will come back soon with her creations; Michelle and Bob who were full of ideas for extra stock. Michelle's going to invent some patterns for the single skeins of handspun yarn in answer to all the people who say, 'What will it knit?' I worked at a cushion, knit one side and crochet the other that is taking longer than I thought to piece together. We re-arranged furniture and displays - this happens on a daily basis to make the most of what we've got. And I think gradually it's looking better and better. You be the judge. Come and visit Handmade Happiness. It's open every day 10-5 except Sundays. Most wood is painted in Borrowed Light by Farrow and Ball. My first choice was Churlish Green, which looked almost lime but I was talked out of that. Might get more daring later! In this picture you can see the way the ribbon ties across the window allowing me to peg different things to it every couple of days. 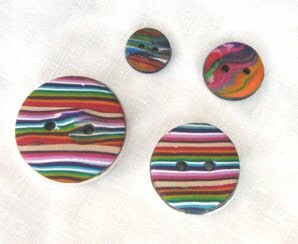 If you ever visited Tricot Too you may remember these. Felt cuffs/wrist warmers and knitted or felted brooches. The perspex towers are actually CD holders. I was lucky enough to see them outside a charity shop for just £2.50 each. Today is day four at the shop. The customers are lovely. It is really interesting talking about what they make. One friend who visited yesterday told me the shop looked 'too pure. Sprinkle some devil's pepper over it.' Ideas on what she meant on a postcard please ...! I love these hand-dyed yarns for sale in Handmade Happiness. Most of them, including the handspun on the right, are the work of Michelle Green. Also by Michelle are the natural dyed yarns pictured with dolls and birds below. The thought of her gathering dock leaves to boil up to make the deep olive greens is fascinating. The mohair with the big label above and the curly lilac yarn are both from Victoria who keeps goats. I now need to contact a lady who keeps alpacas in Sussex and has their wool for sale. Keeping HH stock very local so far. Cards and buttons on the table in the centre of the room. Valerie Benton's knitting and Alison's bag. It's funny. I thought I wanted a habadashery shop but soon realised I didn't want to be tied down to stocking things that didn't interest me like cross stitch kits and tapestry wools. The shop is selling contemporary British craft. In fact everything is made near here in Hampshire or Sussex. There's also the local sheep in the form of handspun and dyed wool. And nice cards by people in the area. Plus some paint stacks I like, the hard back notebooks I like to use, some of my vintage buttons and second hand craft books. I hope you like everything too. As you go in you see noticeboards with photos and things I like on them. This lobby area will have a community noticeboard publicising art/craft events, for sale and wanted and general eye candy. You can just see the top of a lollipop olive tree that my lovely friend Kate Hackett bought me for the shop opening. Starting the virtual shop tour clockwise (wish the picture wasn't so blurred) you can see Michelle's natural dyed wools; my dolls (the gap on the middle shelf is because one of them sold) and Gayle's fab birds and purses. Those birds took the prize for most admired item yesterday. Part 2 of the virtual shop tour tomorrow. Just want to say thank you to everyone who sent emails, texts and cards with good wishes on my opening day yesterday. And thank you for the lovely flowers. It was a good day and talking to customers gave me ideas for how the shop will evolve in the future. Watch this space! This is a picture taken at the Country Living magazine show in London a few years ago. I did this show 14 times, always dreaming and hoping that one day I'd have a shop. Today that dream has come true and tomorrow I'll share photos of how it looks on opening day! I am determined to do a post every day. But today is shop opening eve and I'm pressed for time. Hence the random buttons picture. Electrician 9.00am; sign writer 5.00pm and in between working working working to make the shop look as nice as possible for 10am tomorrow.I'll try to take some pictures of it today. And I've got sewing in my hand as I write this!! Only two days til shop opening now and I'm wishing I had more time for making. Particularly bracelets (along the lines of these vintage Jenny ones pictured but with jewel colours and richer fabrics) and big handmade necklaces. Today I am driving out to Lewes to collect makers' work with a stop off at Homebase to get lights that the electrician is going to install tonight. Also I'm hoping to get the necklaces I started yesterday sewn up and ready to sell. That is literally sewn up! A selection of my makes. Yesterday the rest of the furniture went into the shop. Long display table, heavy bookcase and large desk which will serve as the shop counter. I could not have got them there myself. Kind neighbour Jez and his van took them. A parcel of lovely cards came in the post. Greetings cards made by a friend who often had a nearby stand to mine at the Country Living show. She embroiders and appliques and I always buy her unique cards. And I bought some 1950s silk roses from my friend Penny to sell. They are special too. Today I'm looking forward to Gayle Bicknell visiting with her colour filled work. Wish I had some colourful knitted bunting like this! This is what visitors to the Knitting and Stitching show at Alexandra Palace were greeted with as they walked in the entrance. How many knitting hours by how many people have gone into those flags? Also I agreed lettering for the swing board and the sign writing above the shop front - picture will follow. I tried to find matching floor boards to fill the gap pictured in an earlier post but failed. I'll keep looking. Today I'm seeing my friend Penny whose lovely 'vintage scrap packs' sell so well at Country Living to pick up what she has made for the shop. And my daughter and I helped by Jez across the road and his van will take all the tables to the shop today and hopefully finish shelf and board painting. Whew! I can't wait to sit quietly in the shop and make things again!! ps. I have not sent out any invitations so don't think you've been overlooked. Saturday's opening will be a low key affair and the proper party shop opening will happen on a Saturday nearer Christmas. ok? A sample of Handmade Happiness!